While many Filipinos aspire to go to another country to be an Overseas Filipino Worker (OFW), many are also dreaming to travel to different countries as a tourist. Maybe this year, your resolution includes visiting a foreign country not to work, but to enjoy going around as a tourist. Some Filipinos think that touring on another country always needs a large amount of money and tedious amount of time to process for requirements, especially getting a visa. 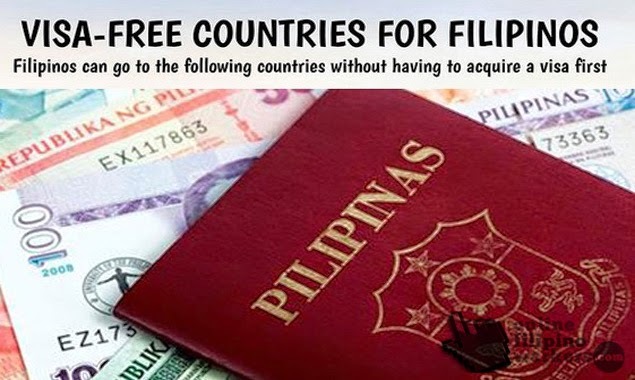 The good news is not all countries require Filipinos to apply for visa. As long as you are a passport holder, you can travel in many countries without a visa. Visa is used by countries to control the number of foreigners going into their territory. It may also show how good the relations of the countries are. With 57 countries to choose from, you might just get the dream vacation you have been wanting for years. And though visa is not required, you still have to present some documents such as proof of accommodation, return tickets, valid ID’s, proof of sufficient funds and your Passport which must be machine readable. Just be reminded that though visa’s are not required to be applied for in our country, the countries will give you your visa when you get to their entry port. And some of the countries may be visa-free only in certain ports like the Jeju Island in South Korea. The consulate you meet in the entry port will decide how long you will be staying for your purpose. In the list, you will see the maximum number of days that you can stay in their country. These are subject to change and you must check the number of days through their immigration website before leaving.